Develop your core skills and critical thinking. Experience all of the different art and design disciplines. Use the skills and confidence you acquire to progress onto an honours degree of your choice. The Foundation Diploma is an exciting, one-year course that prepares you for degree level study in the creative arts. You'll experience the full range of art and design disciplines alongside supportive staff, many of whom work within the creative industries. You will be encouraged to learn through experimentation and risk taking, developing new ways of working and confidence to establish your own ideas.Sunderland has a well-established reputation for innovative art and design projects, with many of these involving social learning and encouraging peer support. The Foundation Diploma is delivered in three stages: The Exploratory Stage, Pathways Stage and Confirmatory Stage. Throughout the year you will be taught in studio-based sessions, supported by a programme of lectures, seminars, workshops and tutorials. Visiting artists and designers often complement this exciting programme. Recent workshops have been delivered in collaboration with the artist Katie Schwab as well as David Cooper, former Head of Menswear at Alexander McQueen. Guest lectures have included Lewis Jones from the Turner Prize winning Assemble and the Granby Workshop. Innovative projects also include those run by our own staff and students as part of Foundation Press. You will choose an area you would like to pursue at degree level. Through a number of exciting and challenging projects, you will develop confidence in the creative process. Alongside this, you will receive support in the skills needed to extend and present your work professionally, including digital skills and portfolio presentation. There are many opportunities to broaden your practice further in live projects, events and exhibitions. Study visits also help inspire your own studies. Working with your tutors, you will develop a self-directed project within your chosen pathway. They will encourage you to develop a distinctive, individual practice in readiness for degree level study and careers in the creative industries. This final project of the year is assessed to give your grade, encouraging experimentation at all of the earlier stages of the course. This course is based at the National Glass Centre a nationally recognised glass production and exhibition centre with world-class production facilities and a programme of international exhibitions and creative projects. Our typical offer is 32 UCAS points from a minimum of one A Levels or equivalent (e.g. 1 x AVCE double award). We accept a maximum of 6 points from Level 3 Key Skills qualifications. There is usually a requirement for three passes at GCSE grade C or above, which must include Mathematics and English Language, or a minimum of Level 2 Key Skills in Communication and Application of Number. If English is not your first language, please see our English language requirements. Applicants must be at least 18 years of age on 31st December on year of entry. This course is free for school-leavers aged 18 at the start of the course and is the ideal preparation for the full range of creative degrees. If you will be 19 or above you may want to consider our Integrated Foundation Degrees. These courses help prepare students for higher-level study on our creative degrees here at Sunderland. 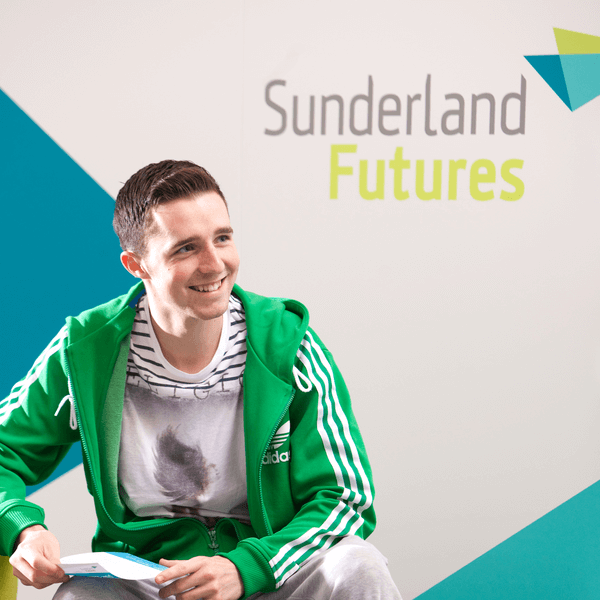 This Foundation Diploma gives you a full year to explore different creative areas and you are guaranteed a place at Sunderland if you complete the course successfully. Students from the Foundation Diploma at Sunderland have gained offers from the most competitive art and design courses in the country. We recently won a national award for teaching excellence (the Advance HE Collaborative Award for Teaching Excellence 2018). This acknowledged the Foundation Press project where students work on innovative, live projects alongside practising artists and designers. Through these enjoyable, social experiences, you will gain confidence in applying your skills in real-world contexts.